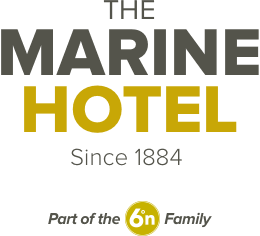 The contemporary restaurant on the first floor with over 50 covers offering excellent views over the harbour, it is extremely popular with residents, locals and tourists alike… Please book early! Our seafood is delivered daily from Gourdon and Aberdeen fish markets with our meat prepared and delivered daily McWilliams of Aberdeen. So, whatever your tastes are, come along and enjoy a well balanced meal in relaxed surroundings situated overlooking Stonehaven harbour. We also match every dish with our extensive list of over 200 bottled beers mainly from Belgium.You may also enjoy an informal meal downstairs in our lounge. Additionally, many of our customers eat from our specials board, which changes daily depending on what fruits the sea provides, offering yet more variety to our recognised favourites. Vegetarians are also catered for on our specials board and starters can also be increased in size to provide alternative vegetarian main courses. We also serve food all day in our downstairs lounge at the above times and all day on Saturdays and Sundays.